RunWest registrations are now open! We’re thrilled to announce that Can Too Foundation is the official training partner and official charity of RunWest - Western Sydney’s first major running festival. The running festival and community event will take place on Sunday 31 March 2019 which includes a 12km fun run and 4km family fun run. The 12km fun run participants will walk, jog or run through the new Sydney Zoo, which opens early next year and the Can Too program includes a free ticket to the new zoo, valid for 12 months from 1 August 2019. Can Too is offering a special 10-week training program, the first session starts on Tuesday 22 January 2019, for up to 100 RunWest participants of all abilities to show they CAN TOO complete the 12km distance by running or walking. In return for taking part in the Can Too coached training program, there is a fundraising commitment of $600 which directly benefits a Western Sydney focused cancer initiative. Can Too participants will also save $30 on their RunWest registration. 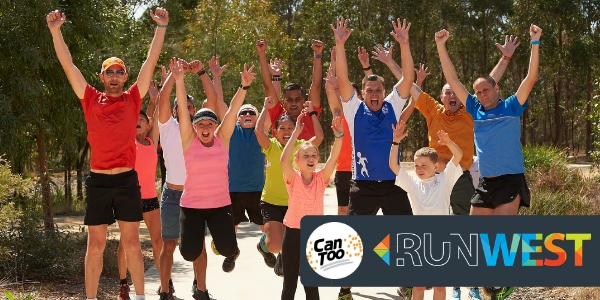 Peter McLean, Can Too Chief Executive Officer is delighted that Can Too, in partnership with RunWest, can offer a fundraising commitment that encourages participation bringing positive health benefits to Western Sydney’s residents. “Our shared vision with RunWest is to promote healthy lifestyles in Western Sydney, which sadly is over represented in cancer rates. By engaging and inspiring individuals and the community to achieve personal health and wellbeing goals that in turn can prevent up to a third of cancers, which are lifestyle related. This is in addition to funding Australian cancer research that the whole country benefits from,” said Peter. Can Too will also provide advice and support for all participants of the running festival through online tips from how to run your first 12kms to how to manage those pre-event nerves, avoid injuries and advice on how to fundraise. Mark Arbib, President of Athletics Australia said that RunWest is a huge first for Western Sydney. “It’s going to bring people of all ages, fitness levels and backgrounds together for a day of being active, raising money for important causes, celebrating what the area has to offer and of course, having fun,” said Mark. The RunWest 12km course starts at Sydney Motorsport Park, runs through the new Sydney Zoo and the Western Sydney Parklands, followed by Blacktown International Sports Park and will finish at the West HQ precinct. The Can Too training sessions will also take place at the course locations: Sydney Motorsport Park, Blacktown International Sportspark and Western Sydney Parklands. The Finish Line Festival will feature live on-stage music, food trucks and free kids’ entertainment.